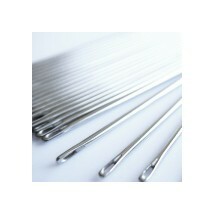 John James Harness Needles	There are 4 products. 1 * John James Harness L3912 Size 18 (1/0) . 1000 Pack. We only charge carriage once therefore you will be refunded any overpayment of carriage if you order more than one pack. Carriage is £7.50 + VAT Goods will only be sent by courier. 1 * John James Harness L3912 Size 2. 1000 Pack. We only charge carriage once therefore you will be refunded any overpayment of carriage if you order more than one pack. Carriage is £7.50 + VAT Goods will only be sent by courier. 1 * John James Harness L3912 Size 3. 1000 Pack. Wholesale only. Carriage is charged on wholesale items at Parcelforce's 48 hour rate. Goods will only be sent by courier. 1 * John James Harness L3912 Size 4. 1000 Pack. We only charge carriage once therefore you will be refunded any overpayment of carriage if you order more than one pack. Carriage is £7.50 + VAT Goods will only be sent by courier.